Canada's official opposition are coming to town! The New Democratic Party will hold it's first caucus meeting of September in St. John's. No comment from Mayor O'Keefe or the Premier on how they feel about the 101 NDP Members of Parliament from across the country holding a caucus meeting in the capital city, which is represented in the House of Commons by New Democrats. It is great to see that the NDP are continuing to show a great interest in this province. Bringing the entire caucus to the province will certainly provide them with a unique insight into the opinions and issues that matter to the people of this province. 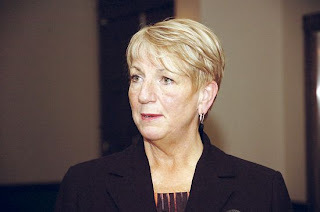 Just last week, Progressive Conservative Premier, Kathy Dunderdale scorned the NDP Leader for endorsing long time NDP activist, and St. John's city councillor, Sheilagh O'Leary for mayor at an NDP fundraiser in St. John's on Saturday night. She said that Mulcair "did not understand the issues and demographics in this province", despite the fact that the federal NDP have supported the Lower Churchill Loan Guarantee and have two MP's from this province. Using the media, she chastised Mulcair, telling him to mind his own business and not to get involved in municipal politics. I assume she will extend a big welcome to the NDP come Sept -6th, as will the the City of Legends.